Designer Timo Arnall has created lamps that change brightness depending on the strength of received GPS signals. The glowing orbs were made with Einar Sneve Martinussen and Jørn Knutsen as part of a research project at the Oslo School of Architecture and Design. 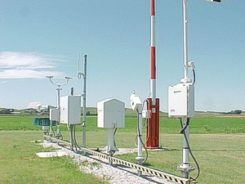 The research began in 2009 with RFID and Wi-Fi projects that aim to reveal technology in a visual way. “GPS is widely used, yet it’s invisible and few of us really have any idea of how it works or how it inhabits our everyday environments. We wanted to explore the cultural and material realities of GPS technology, and to develop new understandings about it through design,” Arnall said on his website. Dubbed “Satellite Lamps,” each orb is embedded with a GPS receiver. As the strength of signal wavers in and out, the glowing orbs become brighter or dimmer. The stronger the signal, the brighter the lamp. “Satellite Lamps shows that GPS is not a seamless blanket of efficient positioning technology; it is a negotiation between radio waves, earth-orbit geometry and the urban environment. GPS is a truly impressive technology, but it also has inherent seams and edges,” Arnall said. Arnall created a timelapse video showing the lamps in action. “When we photograph them as timelapse films, we start to build a picture of how these signals behave in actual urban spaces,” he said. The lamps are part of project to visualize GPS. Read more about how the lamps were created in the research team’s article. Arnell also wrote about the popular cultural history of GPS. 1 Comment on "Glowing Orbs Reveal Presence of GPS"
What a total and utter waste of time and money! Hopefully it’s not being done with a public grant….